Sacha Baron Cohen, the man of many personalities, will be developing a feature film for Paramount called ‘The Lesbian’. This project is inspired by real life Cecil Chao, the Hong Kong billionaire who offered $65 million dollars to any guy who succeeded in marrying his lesbian daughter. This seems like the perfect project for Sacha Baron Cohen. Chao’s story made international headlines according to Deadline, with reports that his daughter had a Church bless her relationship with her longtime girlfriend. So, Cohen will be producing and most likely writing the film, and I bet in time, we will find out that he will be starring the film, most likely the role of Cecil Chao. Who would play the daughter? And what lines will Cohen step over this time? I can’t wait to see. This could be hilarious. Your thoughts? Check Out the 2nd Trailer for Sacha Baron Cohen’s ‘The Dictator’!!! 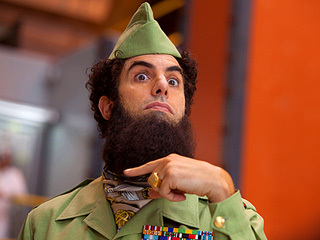 Bryan’s Review of ‘The Dictator’!!! This entry was posted on Thursday, October 4th, 2012 at 4:57 pm	and is filed under Film, News. You can follow any responses to this entry through the RSS 2.0 feed. You can skip to the end and leave a response. Pinging is currently not allowed. « Bryan’s Review of ‘Taken 2’!! !